Gonna admit something: Pumpkin-flavored things usually make me want to skip in the opposite direction. It’s not because pumpkin isn’t awesome, it’s because all those cheap imitations of pumpkin flavor are usually so disappointing in a myriad of ways! Pumpkin “flavor” tends to be cloying and overpowering, unlike the personality of most pumpkins. It’s either pumpkin FEVER where you can’t taste anything else, or it’s dusty pumpkin or it’s non-starter pumpkin, where you’re not sure what it is… but it isn’t pumpkin. I feel like I’ve arrived at Fall! Can I have a few more? Mmmmm! If you’re looking for “pumpkin in your face” you’re not going to find it here. It’s like they somehow knew that last year’s white chocolate candy corn M&Ms were too far into the stratosphere to really be understood. Somehow we have a candy that shows restraint. When you try it, there are multiple avenues for your mind to visit as they melt in your mouth. There’s pumpkin… but there’s also cinnamon, obscure hints of other spices, and mostly chocolate. And I think it’s a good idea that they are chocolate, and that M&Ms stayed away from the white chocolate for this one. Not every new flavor has to make you do a backflip and a fist pump, some flavors can just be mellow and complex. In the world of artificial flavors, it seems like they never know when to ease up on the throttle, and this time somebody decided to mellow out. Anyone who grew up eating Flamin’ Hot Cheetos will not understand or be able to comprehend the subtleties of Pumpkin Spice M&Ms. They will think that Pumpkin Spice M&Ms are a penultimate experience, because their taste buds are dead. They will shrug their shoulders and walk away. 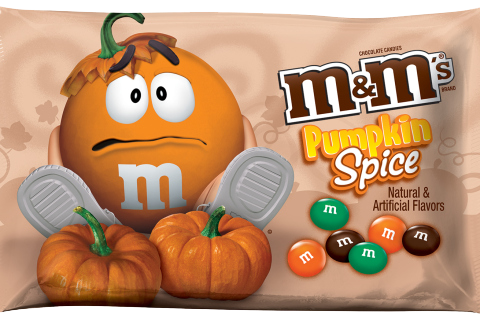 They will feel like the illustration of the bewildered pumpkin M&M on the bag. People are all up in arms arguing that these things taste more like red hots than pumpkins… and as a person who dislikes red hots pretty vehemently, they don’t taste like red hots. But they don’t overwhelm you with orange squash flavor either. There are three colors in the bag: Dark Brown, Orange and Dark Green, a hilariously awful set of colors, it’s like they’re trying to convince children to stay away from them. Even sports teams don’t go near this trio of colors! I’m sure that ©Mars had 19,000 focus groups before they developed these, I’m thinking it’s a small miracle this product ended up on the shelves. 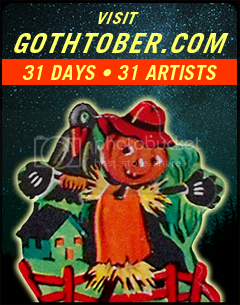 This pumpkin idea is trying to get distinguished, it wants to be respected and well-received. It’s reaching out to people who like potpourri and crisp air and scented candles. It’s for square metal candy bowls in offices, and houses with a lot of square footage and reflective surfaces. Kids will think they are boring. Eating these and liking them might mean you are over 30. It might even mean that you are retired. If you have just ONE, and wait for it to melt in your mouth for 10 seconds, you might be pleasantly surprised.